Background: Scientific fraud is an increasingly vexing problem. Many current programs for fraud detection focus on image manipulation, while techniques for detection based on anomalous patterns that may be discoverable in the underlying numerical data get much less attention, even though these techniques are often easy to apply. Methods: We applied statistical techniques in considering and comparing data sets from ten researchers in one laboratory and three outside investigators to determine whether anomalous patterns in data from a research teaching assistant (RTS) were likely to have occurred by chance. Rightmost digits of values in RTS data sets were not, as expected, uniform; equal pairs of terminal digits occurred at higher than expected frequency (> 10%); and, an unexpectedly large number of data triples commonly produced in such research included values near their means as an element. We applied standard statistical tests (chi-squared goodness of fit, binomial probabilities) to determine the likelihood of the first two anomalous patterns, and developed a new statistical model to test the third. Results: Application of the three tests to various data sets reported by RTS resulted in repeated rejection of the hypotheses (often at p-levels well below 0.001) that anomalous patterns in those data may have occurred by chance. Similar application to data sets from other investigators were entirely consistent with chance occurrence. Conclusions: This analysis emphasizes the importance of access to raw data that form the bases of publications, reports and grant applications in order to evaluate the correctness of the conclusions, and the importance of applying statistical methods to detect anomalous, especially potentially fabricated, numerical results. This paper tackles the serious problem of detecting fraud by applying and developing multiple methods: terminal digit frequency analysis and tests using the mid-ratio, based on a probability model for the triplicate count data. In this review, we first attempt to replicate Pitt and Hill's results using the data they published, and second, offer several points of clarification and discussion about their methodological contribution. We would like to thank the authors Pitt and Hill for publishing their results in an open journal and making their data available online, enabling us to attempt this replication. This review was vetted by Philip B. Stark. However, the work was conducted entirely by the authors, and the opinions expressed in this review are those of the authors. The goal of Pitt and Hill’s work is to develop a test based on the mid-ratio and demonstrate its usefulness by applying it to a specific data set. For their data set, Pitt and Hill test the hypothesis that the data from a particular researcher (the RTS) were generated in a way so unusual as to suggest fabrication. Their first test, digit frequency analysis, is a common method of detecting fraud in many kinds of datasets. The analysis of midratios is much more specific to the radiobiological preclinical data, since the midratio involves triplicate measurements of counts. Pitt and Hill model "honest" triplicate colony count data and Coulter count data as independent triples of IID Poisson variables. That is, each triple consists of three IID Poisson random variables, and the set of all triples is independent (but not identically distributed: in general, different triples have different rates lambda). The bulk of the paper involves deriving or approximating the corresponding null distribution of the test statistics they consider, and applying those tests. They find that the RTS data are inconsistent with this null hypothesis. After replicating Pitt and Hill’s major findings, we agree with the conclusion that the RTS data were not generated in the same fashion as the other investigators. While we offer small critiques of each method, the general strength of the evidence is such that we agree with the conclusions in the paper. First, we replicate the results of Pitt and Hill’s major analyses. Our code and results are available at https://github.com/sldegraaf/preclinical-data-review. We independently replicated the terminal digit analysis for all of the data sets and found almost exactly the same results. The only major differences were for the Coulter-RTS and Colonies-Others data sets, in which our counts were a bit higher than those reported in the paper. We applied the exact same code to all datasets, and most of our results matched the results in the paper perfectly. The fact that our Coulter-RTS and Colonies-Others counts were slightly higher suggests some of the data may have been filtered out of the original author’s analysis, but we were unable to infer the cause of the differences. Our counts are provided in the table below, where the bolded, underlined entries indicate the counts that differ from those in the paper. These differences were all very small and thus did not meaningfully change the Chi-squared test statistics or implication of the results. We also replicated the analysis of the final two digits in each of the counts and also found that the RTS data was suspiciously non-uniform. In the paper, the authors test the occurrence of equal digits in the last two digits for the Coulter RTS and Other data sets, restricted to values with at least 3 digits. We replicated this analysis and found similar results, with RTS having 12.4% of values with equal last digits and Others having 9.9% equal. Under a binomial distribution with probability .1 (meaning an assumption of uniform distribution), these outcomes have the one-sided probabilities of being greater than the observed quantities of 7.8 E -09 and 0.55 respectively, which is strong evidence to be suspicious of the RTS data set. To replicate the results of mid-ratio analysis, we calculated the mid-ratios for Colony counts in the RTS data and Other Investigators’ data. As in Pitt and Hill's initial findings, our results indicate an overwhelming predominance of midratio values in the 0.4-0.6 range in the RTS data, compared to a uniform distribution in the Others' data. To ensure that the uniform distribution is what we should expect from genuine data, we also looked at the distribution of the midratio on the Outside Lab's data, which Pitt and Hill did not include in their results. While there were fewer triples to consider, the distribution of the midratio still appeared uniform, supporting Pitt and Hill's conclusion that the RTS data is unusual. In addition, we checked the uniformity of the midratio distributions in the Coulter counts. Pitt and Hill also did not include this analysis, and when we analyzed the Coulter counts, the mid-ratios did not reveal anything unusual. Pitt and Hill then constructed two tests using midratios based on the probability that a midratio falls in the interval [0.4,0.6]. Their first test relies on the assumption that for any value of lambda, the probability that the midratio is between 0.4 and 0.6 is less than 0.26. This assumption was validated numerically. If triples are independent and identically Poisson distributed and the sets of triplicate counts are independent, the number of triples for which the midratio is in [0.4, 0.6] is stochastically smaller than a Binomially distributed random variable with p = 0.26 and n equal to the number of triples, as Pitt and Hill claim implicitly. We used a binomial-based significance test, and found that out of 1361 triples, 824 of the midratio values fell into the range [0.4, 0.6], yielding a highly significant p-value near zero. To check the RTS findings against a theoretical distribution, the authors assert that each triple t can be modeled as a set of IID draws from a Poisson distribution with common parameter lambda_t. The comparator distribution permits us to answer the question: what is the probability that from n triples, k will include their means as one of their values? Pitt and Hill derive a probability model from the properties of the Poisson distribution, which we did not check in detail. Instead, we incorporated their assumptions into a simulation, in which we drew 10,000 triples for each value of lambda from 1 to 2,000, and then estimated the rate of mean-inclusion for each lambda. This yielded a set of simulated probabilities that corresponded closely to Pitt and Hill’s “MidProb” table. Using these probabilities, Pitt and Hill conduct three tests of significance. The first “crude” test simply finds the maximum probability (which happens to be where lambda = 4), uses that to calculate the binomial probability of n triples in which k contain their means. This essentially approximates an “upper bound” for the p-value. This is a straightforward calculation, and we were able to replicate the authors’ results. The second, more refined, test relaxes the requirement of constant lambda. Instead, it treats the RTS data as a series of Bernoulli trials (where “success” indicates that a triple includes its mean). Each trial has a distinct probability of success derived from our “MidProb” table, with the lambda parameter set as each observed triple’s mean (lambda is the Poisson maximum likelihood estimator). This yields a Poisson binomial distribution (the distribution of the sum of independent Bernoulli trials with non-equal probability), whose density can be readily estimated. We did not precisely replicate the authors’ results here, because our simulated probabilities were slightly different to those in the paper, but we confirm their overall conclusion with respect to the RTS data. We are slightly less confident with respect to the data for other investigators, but again our conclusions are not materially different. As we report in the terminal digits analysis, our number of cases was slightly higher (k = 128; n= 597), leading to a p-value of 0.17 — some distance from their 0.58, but not a statistic which renders the data improbable. Finally, the authors use the normal approximation of the Poisson binomial to calculate traditional z-scores. Here, our results closely mirrored the authors’; a z-score of around 34 is strong evidence against the null hypothesis. In a general sense, it is important that hypotheses used to detect fraud be formulated and specified prior to conducting any exploration of the data. From a statistical point of view, it is always possible, genuine randomness notwithstanding, to find some unusual pattern in a sample of data if enough features are analyzed. However, these unusual patterns do not reflect any true departure from randomness and should not be used as evidence that data are not genuine. That is, in statistical terms, it is still possible to obtain significant p-values for unusual characteristics of the data, but these p-values no longer have the same interpretation if hypotheses were not pre-specified. To demonstrate how easy it is to find “unusual” features present in data, consider the data for the Other Investigators' Colony counts, which Pitt and Hill deem to be genuine. In the triplicates, it appears that the lowest value of the triple appears in the first column of the data quite often: in 230 of the 597 cases the lowest value is in the first column, a proportion of 0.385. In a “truly random” scenario, we would expect 1/3 of the lowest values to be in column 1. Thus, if we treat each triple as an independent random trial with probability 1/3, we can conduct a binomial test of significance on the 597 trials. Our sample estimate returns a p-value of 0.00437, indicating that the probability of seeing the smallest value in the first column is significantly higher than it would be due to chance alone. This is clearly an incorrect interpretation of the p-value, however, since we did not hypothesize that low values would be in first column until after observing this phenomenon. This simple example serves to emphasize the importance of selecting metrics of fraud before exploring the data. The terminal digit analysis is a standard metric and it is logical to assume that this hypothesis would be specified before looking at any data. However, the midratio analysis seems to be a characteristic of the data observed after looking at the data. Pitt and Hill even acknowledge that their decision to test mid-ratios came after "[h]aving observed what appeared to us to be an unusual frequency of triples in RTS data containing a value close to their mean". This casts some doubt on the validity of the p-value; however, the significance of the midratio test was so strong that we feel confident that the conclusion is valid. As you can see, the distribution is quite a bit heavier for the smaller values of the last two terminal digits. 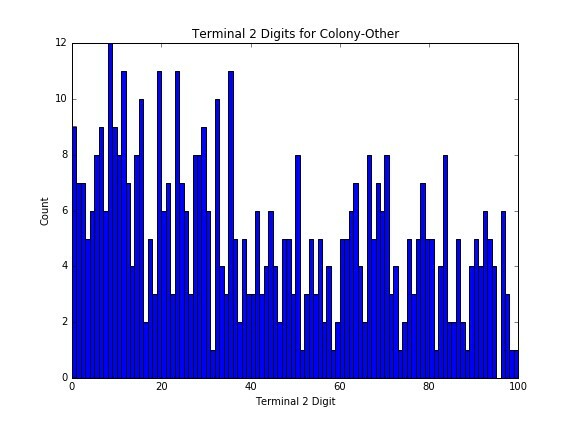 For this reason assuming that the last 2 digits of each number should be equal 10% of the time would not be valid, and it is good that the authors did not apply the equal digit analysis to the Colony data sets. It is also worth wondering why a more general test of the uniformity of the final two digits such as a chi-squared test on all 100 possible two digit combinations was not used. We performed such a test and found that the probability for the Coulter-Other data set was only 0.06. This results leads us to question the Coulter Equal Digit probabilities given in the paper, as the 10% assumption for the equal digits relies on the overall distribution of last two digits being uniform. If the authors noticed that the RTS data set had a large number of data points with the last two digits being equal and only then applied the statistical test, that would reduce the persuasiveness of the result. In our opinion the Terminal Digit analysis already shows that the data is not distributed as expected, and the Equal Digit Analysis only complicates this analysis with less persuasive evidence. In general, we agree with the logical formulation of the model in this section, but we are curious about the choice of distribution to model the count data. In general, the Poisson distribution is a natural choice to model count data because it is a generalization of the Binomial, as the Binomial parameter n goes to infinity and p goes to zero. However, in this scenario, it is unclear whether the number of colonies formed by surviving cells is an appropriate application of the limits of a Binomial. In addition, we have concerns about the parameter estimation in each triple. The sample mean for each triple is indeed the maximum likelihood estimator of the Poisson lambda parameter, but with only three data points available to estimate this parameter, these sample means are unlikely to be reliable estimates of the true parameters. It might be better to incorporate shrinkage methods or use a Bayesian approach to share information across all colony triples to get more reliable estimates of each triple’s mean. Since the strength of evidence in this scenario is so strong, we do not think these criticisms would change the conclusions, but they would be quite salient in scenarios where the evidence is not as strong. Once again we find that the RTS datasets do not conform to the uniformity assumptions while the other investigators have data which is consistent with the assumption of means uniformly distributed across the columns. We believe that this information in conjunction with the other evidence presented further enhances the case that the RTS data is not genuine. While we have raise several technical points of consideration about Pitt and Hill's methodology, the evidence in general is strong enough for us to arrive at the same conclusion — the RTS data is statistically different from the rest. In general, we found Pitt and Hill’s work to be both convincing and valuable for future work in detecting fraud. Crucially, their paper illustrates the importance of developing statistical methods to detect fraud in data that would otherwise appear genuine, and contributes valuable tools for detecting fraud in similar preclinical radiobiological data sets. While the triplicate probability model was designed specifically for this type of data, Pitt and Hill’s ideas can be applied more generally; this model provides a general framework for future methods to be developed for other types of datasets. Statistical analysis and verification of forensic age estimation of living persons in the Institute of Legal Medicine of the Berlin University Hospital Charité.